Here is an update to a scouting report over the summer of Mikal Bridges. Bridges has drastically improved as a junior, going from 10 PPG as a sophomore to 18 PPG on an even better 3P%. Bridges’ breakout has been noticed by all draft outlets, but his 3&D role in the NBA is very promising. Overall: Bridges likely would have been a late first round pick in 2017, had he declared. Bridges has excellent tools that make for a high floor, thanks to his 3&D potential. His shot is somewhat slow, but it is effective in college and his FT% is high, which is a good predictor for NBA shooting success. 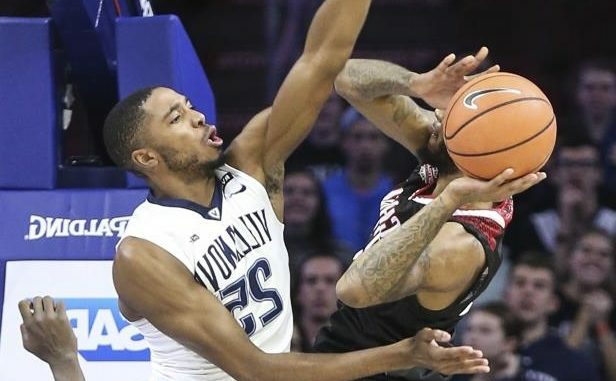 Bridges was the Big East defensive player of the year in 2017, and over the summer, coach Jay Wright called Bridges his best defensive player ever. There are still questions about his scoring upside in the NBA. He has improved his shot off the dribble, but hasn’t made it a consistent threat in his arsenal. Early on, his NBA success will be as a spot up shooter that plays great defense. Mikal Bridges’ fit with the Mavericks: Bridges’ archetype is perfect for any team in the modern NBA. However, with all the supposed star power in the 2018 draft, Bridges may not be a great fit with the Mavericks due to other players having significantly higher ceilings than Bridges. Bridges has one of the highest floors in the draft, but his ceiling seems limited due to his lack of explosiveness on the offensive end. Bridges would be a great fit with the Mavericks’ offense, and he would likely play a similar role that Wesley Matthews has filled in his time in Dallas. They are similar players, but Bridges seems to be much more similar to the Wesley Matthews of Portland more than the Wesley Matthews of Dallas. Matthews gets ample open shots, and if Bridges got the same looks, I imagine he would be shooting a higher percentage than Matthews. Bridges rarely plays outside of his limitations, meaning he wouldn’t do a lot of the overdribbling that Wesley Matthews has done in his time in Dallas. However, Matthews and Bridges could be about the same impact defensively, which is a big compliment to Bridges.